Printable Black & White PDF Printable Color PDF More Paper Dolls & ClothesI had several space princess paper dolls when I was a kid. I don’t know the exact source of the space princess obsession of the late 1980s and early 1990s, but I remember this paper doll card really well. My grandmother often sent me paper doll cards as a child. I can recall nearly every one, which is astonishing when I think of all the things I can’t recall from my youth. Anyway, I wanted to make a space princess paper doll and I was inspired by this gown designed by Guo Pei. Guo Pei is a Chinese fashion designer. Her work is amazingly inventive and creative. Much like Alexander McQueen (another designer I adore), Guo’s designs are often hard to imagine a person actually wearing, but that makes them all the more enchanting to me. Her designs are harder to find on the web (though perhaps not if you speak Chinese) and Vogue only has her 2016-2018 collections on their website. I think this dress is from 2010, but I am not positive. Anyway, that was the inspiration for the gown and everything else flowed from that. 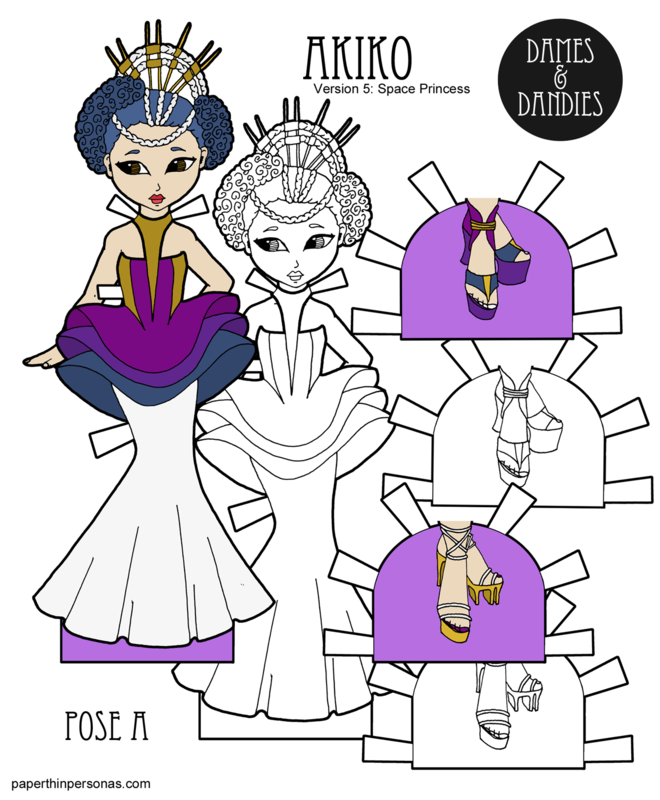 I love creating over the top hair styles, so I did one of those for Akiko and her shoes were inspired by her gown. I did want to wish people a Happy Hanukkah to everyone who, like me, are lighting candles for the next week. I don’t have holiday plans for the blog this year. I totally forgot the holidays, so this will be a holiday free blog this year. But I have done Hanukkah paper dolls in the past. Let me know what you think of today’s paper doll in a comment. I’m super curious if anyone else was into Space Princesses as a child? And what do you think makes a Space Princess? Oh she’s so cool. I love the hair headdress and her silhouette. I think i might color this one for fun. I wasn’t into Space Princesses as a child, but I am as an adult. This is one of your best outfits yet!! !